Lausanne, 2nd April 2019 – The 2018/2019 Ski Mountaineering World Cup has come to its final act. For the fourth time in the history of the circuit – and for the second consecutive year – it will be held on the snows of Madonna di Campiglio (Italy). From Wednesday 3rd to Saturday 6th April the best skimo athletes, representing 14 nations, will compete in the presence of the Brenta Dolomites, where a Sprint race, a Vertical race and an Individual race will be staged. They will be crucial for the assignment of the crystal balls, both for the overall ranking and for the specialties. A special remark will be on the Italian Robert Antonioli, the star during the World Championships in Villars-sur-Ollon (Switzerland) with two gold, two silver and one bronze medals. The athlete coming from the Valtellina area jumped to the top of the overall ranking in the last weekend in Disentis (Switzerland) and now aims for closing at best a memorable season. His opponent number one will be the German Anton Palzer, who currently chases him in the ranking with 34 points of distance (580 against 536). Immediately after them there is the winner of the 2017/2018 ISMF World Cup Michele Boscacci (ITA) with 410 points. Among Women, a Spanish derby is looming between Claudia Galicia Cotrina (559 points) and Nahia Quincoces Altuna (534), while the racer from Belluno (ITA) Alba De Silvestro is ready to insert with her 445 points. In the Junior category the command surely belongs to the Russian Ekaterina Osichkina (900 points), followed by the Italians Samantha Bertolina (530) and Valeria Pasquazzo (450). The three-day programme in the setting of the Brenta Dolomites, organised by the local 3Tre Committee and the APT of Madonna di Campiglio-Pinzolo-Val Rendena, will open on Wednesday 3rd April. The spectacular Sprint race will take place on the slope of the Canalone Miramonti with the qualifications at 4.30 pm and the finals starting at 8.00 pm. On Thursday 4th April at 6.00 pm instead it will be the turn of the Vertical race on the Spinale Diretta track and after the grand finale will come on stage on Saturday 6th April with the 45th International Ski Alp Race Dolomiti di Brenta. The start will be given at 9.30 am for the Senior Men and the Espoir Men and at 9.45 am for the Senior Women, the Espoir Women and the Junior Men. At the end, at 10.15 am, it will be up to the Junior Women. 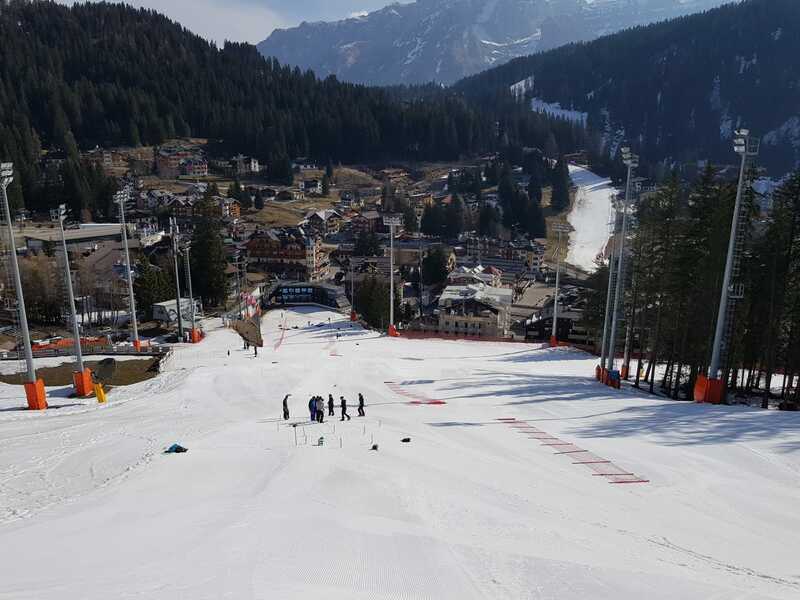 The final award ceremony will take place at 2.00 pm at the Palacampiglio, while those of the Sprint and Vertical races will be held in Piazza Sissi at 5.30 pm on Friday 5th April, during the rest day for the athletes. Senior Men Overall Ranking: 1. Robert Antonioli (ITA) p. 580; 2. Anton Palzer (GER) 546; 3. Michele Boscacci (ITA) 410; 4. Jakob Herrmann (AUT) 347; 5. Werner Marti (SUI) 345. Senior Women Overall Ranking: 1. Claudia Galicia Cortina (ESP) p. 559; 2. Nahia Quincoces Altuna (ESP) 534; 3. Alba De Silvestro (ITA) 445; 4. Marianne Fatton (SUI) 405; 5. Axelle Gachet Mollaret (FRA) 388. Espoir Men Overall Ranking: 1. Thibault Anselmet (FRA) p. 505; 2. Davide Magnini (ITA) 497; 3. Samuel Equy (FRA) 462. Espoir Women Overall Ranking: 1. Giulia Murada (ITA) p. 720; 2. Lena Bonnel (FRA) 485; 3. Ilaria Veronese (ITA) 370. Junior Men Overall Ranking: 1. Aurélien Gay (SUI) p. 550; 2. Giovanni Rossi (ITA) 519; 3. Patrick Perreten (SUI) 508; 4. Sebastien Guichardaz (ITA) 501. Junior Women Overall Ranking: 1. Ekaterina Osichkina (RUS) p. 900; 2. Samantha Bertolina (ITA) 530; 3. Valeria Pasquazzo (ITA) 450.